Karibou is a physical literacy program for children 1 to 5 years old accompanied by a parent. Children go around courses, learn through group tasks and take on challenges that will allow them to gradually develop an interest for sports and physical activities. Each 50-minute class allows them to execute a wide range of movements including throwing, catching, jumping, dancing, rolling and running. Obviously, the primary objective is for them to simply have fun! Designed specifically to meet the needs of children aged 1 to 5 years old. 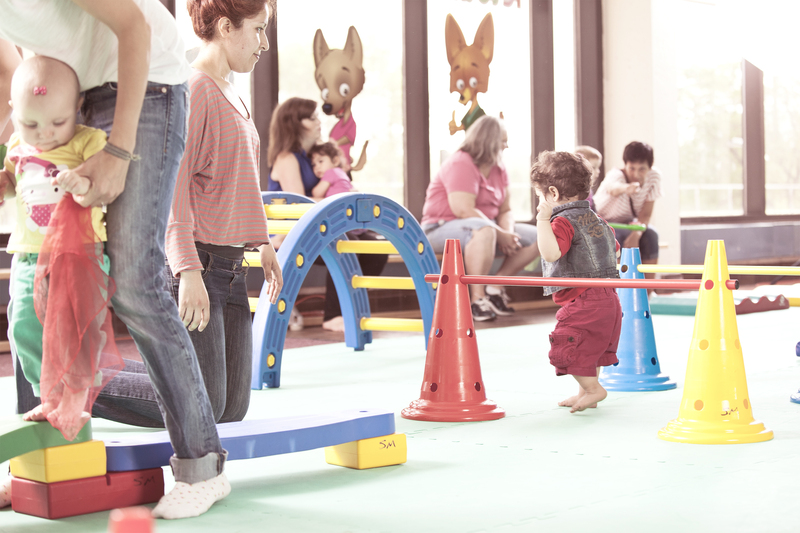 Karibou stimulates their motor and social skills with its equipment adapted and suitable for toddlers. Leader of the group, Karibou invites toddlers to adopt a physically active lifestyle. By involving parents, he wants the whole family to take pleasure in moving. With Karibou, you can rest assured that you are participating in a quality program, surrounded by qualified instructors. At this age, the child walks alone or with assistance. This level will stimulate the crawling and walking process. The child will have the opportunity to crawl, climb and step over. He will also perform non-locomotor movements and be able to manipulate new objects. At this age, the child is beginning to run but he falls frequently. With this level, the child will develop amongst other things walking, running, climbing, stepping over and throwing. They will also be able to manipulate new and different objects. At this age, the child runs better, goes around in a circle, hops, climbs, and dances. With the Rascally Raccoons, the child will develop more autonomy and will practice non-locomotor movements such as bending, stretching, throwing, pushing and pulling. At this age, the child likes to build small towers with blocks and jumps from a short height. With the Buddy Bears, he will further develop the manipulation of objects and improve gestural communication through symbolic play. At this age, the child jumps with both feet together and can balance himself on one foot for a few seconds. He is also beginning to ride a tricycle! With the Wonder Wolves, the child will refine his walking and running movements, his non-locomotor and object manipulation movements. At this age, the child can catch a ball with arms extended and can hop on one foot 2 or 3 times. With the Feisty Foxes, the child will develop his autonomy and will practice his fundamental movements of general coordination, his eye-hand and eye-foot coordination. At this age, the child jumps several ways, can change direction while running and throws with a vertical axe body rotation. With the Energetic Eagles, the child will develop and take his physical capacities, his socialization and his motor skill abilities to a new level. I adored the Karibou classes for my 3 daughters. There is a lot of equipment and challenges for every age level. I myself am a child educator and I sometimes use their advice to make mini obstacle courses with the material that I possess. I also recommend to the parents that use my daycare service to register their children to the Karibou classes. Thank you for enabling our children to move so well and with so much pleasure! My 2 years old daughter loves Karibou! She takes pleasure in overcoming the proposed weekly challenges. The activities are thought through so that the child can have fun and succeed. Watching all the other friends move encouraged her to participate and socialize with the others. With Karibou, your child will develop himself a lot, on multiple levels and all while having fun! Very nice activity! This was the first time that I registered my child to the Wonder Wolves level with the Loisirs Duberger Les Saules. Not only did my son have the chance to develop his motor skills but he also had the chance to move with the other friends, learn to share, to wait his turn and respect the instructions with the other children. It is marvelous. It is a complete learning process. It has almost been a year since his Karibou classes and my son still talks to me about his animator, Karelle! We are starting this September with the Feisty Foxes. Guaranteed quality program developed and approved by motor skill specialists for children. Certified instructors, trained specifically for the Karibou program. Fun universe with songs, games and crafts. Made to measure equipment and activities for the child’s age group! Perfect occasion to be a role model to your child and teach him the pleasure and the importance of moving. Participant's notebook to note the progress of your child.